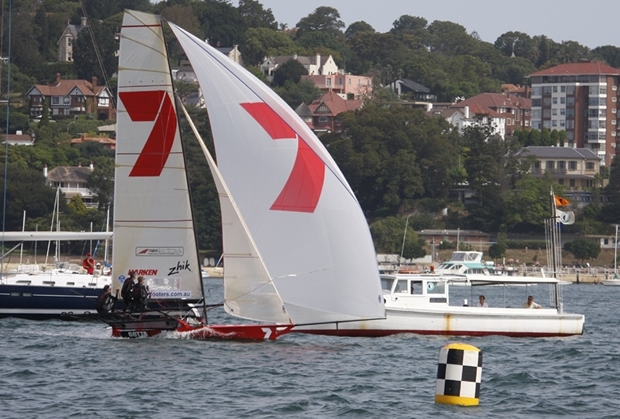 Defending champions Seve Jarvin, Sam Newton and Tom Clout retained their Australian Champions crown despite finishing second in Gotta Love It 7 in Race 5 of the SP HighModulus-sponsored regatta on Sydney Harbour today. NSW champions Michael Coxon, Aaron Links and Trent Barnabas took today’s honours by 54s in Thurlow Fisher Lawyers and tied the pointscore with Gotta Love It 7, but had to be content with second placing overall after a countback. Gotta Love It 7 recorded two wins in the championship to Thurlow Fisher Lawyers’ one win to decide the victor. Former Australian champion John Winning (Yandoo) finished a further 1m54s back in third place today, ahead of Project Racing (Andy Budgen), Rag & Famish Hotel (John Harris) and Appliancesonline.com.au (John Winning Jr.). Final overall pointscore was Gotta Love It 7 on 9 points, Thurlow Fisher Lawyers also on 9 points, Smeg (Nick Press) third on 17, followed by Rag & Famish on 20, Slam (Grant Rollerson) on 25 and Project Racing also on 25 points. A 12-15 knots ENE breeze prevailed for the last race of the championship which drew a maximum crowd to the club spectator ferry. Thurlow Fisher Lawyers won the start and sailed a perfect course to take full advantage of the run-out tide. At the windward mark the skiff held a 25s lead over Gotta Love It 7, with Thurlow Fisher Consultants (Bruce Savage) in third place ahead of Yandoo. There was no change at the wing mark and Thurlow Fisher Lawyers maintained a 30s advantage at the bottom mark. With the leading pair establishing a break over the rest of the fleet it was obvious that Gotta Love It 7 was going to get the title. Rag & Famish Hotel was placed fourth for most of the course, but Project Racing sailed superbly over the latter half of the race to grab fourth place by just 13s - after being 18th at the first wing mark. Behind the first five skiffs there was a great battle amongst a group, including Appliancesonline.com.au, Pure Blonde (James Francis), Smeg, Thurlow Fisher Consultants, Slam, Asko Appliances (Archie Massey), Gill (Dave Alexander), De’Longhi (Simon Nearn) and Kinder Caring Home Nursing (Brett Van Munster). There will be a Twilight race next Friday, followed by a race in the Club Championship series on Sunday with some of the visiting overseas competitors expected to sail in both races.